Saturday’s XTERRA European Championship elite race has attracted the best-of-the-best off-roaders in the EU and beyond to Mons Klint, Denmark for the last of 14 majors on the European Tour. Forty-four elites representing 19 countries are on the start list, including the top 10 ranked men and five of the top seven women in the Tour standings. Saturday’s XTERRA European Championship elite race has attracted the best-of-the-best off-roaders in the EU and beyond to Mons Klint, Denmark for the last of 14 majors on the European Tour. Forty-four elites representing 19 countries are on the start list, including the top 10 ranked men and five of the top seven women in the Tour standings. In the men’s race three-time XTERRA World Champion Ruben Ruzafa from Spain has already wrapped up the XTERRA European Tour title having collected an unsurpassable 565 points by winning six of the seven races he did in Europe this season, however, he’s anxious to collect his third straight Euro Tour title and build momentum heading into XTERRA Worlds in October. “I think it’ll be important to Ruben to win this one and build his confidence for Maui,” said XTERRA European Tour director Nicolas Lebrun, who himself won the first-ever XTERRA European Championship race in Italy back in 2006. 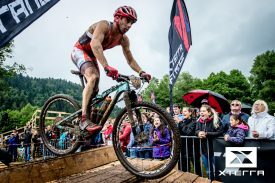 Ruzafa has won 30 XTERRA championship races in his career, and his main weapon is the bike. “He’s smart, and he knows how to perfectly manage his pace on the bike so he also has energy for the run. He’s also very skilled at passing other riders, and with four loops on the bike here in Denmark he’ll be able to use those abilities to his advantage,” said Lebrun. This year, for the first-time since Conrad “the Caveman” Stoltz was still in the game, there is another name in the mix when talking about who the best mountain biker in the sport is. Dafflon did make up the time in Italy, where he picked up his first XTERRA win as a pro, and Belgium where he posted a faster bike split than Ruzafa. “For Dafflon to win here he will need to limit his losses on the swim, get lucky passing through all the riders on his way to the front, and then use his climbing skills on the run to pull in front,” said Lebrun. Of note, the signature spot on this course is a climb, the infamous 497-stairs that swimmers have to run-up to get to the bike-to-run transition, and then again at the very end of the run before the finish. “I think Dafflon can make up one-minute on those stairs coming out of the water because he is so strong on the climb, and then again at the end of the race if he is in contention the stairs will be good for him,” said Lebrun. Sam Osborne from New Zealand comes into this race with the most momentum having won the last two races on the Tour in Poland and Germany. He was also second here in Mons Klint last year, finishing less than one-minute behind the reigning XTERRA World Champion Mauricio Mendez. Other racers at the top of the contenders list include Francois Carloni from France, who is currently ranked 2nd in the Tour standings, Arthur Serrieres from France, XTERRA Cyprus Champion Yeray Luxem from Belgium, Roger Serrano from Spain, and Bradley Weiss from South Africa. In the women’s race the rivalry between Helena Karaskova-Erbenova and Brigitta Poor rages on. Karaskova-Erbenova, a three-time XTERRA European Tour Champion, has won four races this year. Poor, the reigning Tour champ, has won five races including the last two. In the XTERRA European Tour standings Karaskova-Erbenova is 33-points ahead of Poor with 720 points, and simply needs to finish fifth or better to win the Tour title. Should Poor win the race, and Karaskova-Erbenova finish sixth or lower, the tour goes to Poor. Of note, outside of the dirt the two are good friends and will ride and travel together. The only racer in the field who has proven she can go faster than those two on any given day is Carina Wasle, winner of XTERRA Saipan, Reunion, and Philippines this year. She was second at this race last year behind Poor. Other top contenders include Nicole Walters, who should lead the swim and is powerful on the bike, and the speedy Kiwi, Lizzie Orchard. Follow the elite race live on Facebook.com/xterraeurope on Saturday, September 2, starting at 2pm local time. There will be 400 amateur racers chasing age group and overall titles at Sunday’s XTERRA European Championship race in Mons Klint. Earlier this week we talked about the XTERRA European Tour title contenders, and here we look at the favorites for the overall individual titles. Two Danish racers top the list for the men, last year’s overall amateur XTERRA Denmark Champion Allan Bachmann, who placed 14th overall last year, and five-time Olympian (rowing) Eskild Ebbesen. There are two Frenchmen in the hunt, Robin Tournant and Benoit Lalevee. Robin won the overall amateur title at XTERRA Poland this year and Benoit is a former XTERRA World Champion. There’s an American in the mix, Rife Hilgartner, the reigning 45-49 XTERRA Pan America Tour Champion, and a Spanish standout named Javier Notario Fernandez who won his age group at XTERRA Germany two weeks ago. In the women’s chase Javier’s girlfriend, Eva Garcia Gonzalez, looks to be the woman to beat. She won her division at every race she did this year – XTERRA Germany, Italy, Portugal, and Spain – and was even competitive with the elite women having finished third overall in Spain and Italy, 6th in Portugal and 9th in Germany. Local Danish favorite Carol Rasmussen, the reigning and three-time XTERRA World Champion in the 50-54 division, will provide a strong challenge. She was the top amateur at this race last year and fifth overall woman. Cecilie Overbye is another fast Danish competitor, and won the overall title at XTERRA Norway three years ago. Then there is Riikka Vreeswijk-Kelja, a swim instructor from the Netherlands and the reigning 45-49 European Tour Champion. Riikka used to race in the pro ranks (she was in the top 10 in the elite tour standings four times between 2004-2009), and will be in contention for the overall on Sunday.